Looking "where to sell my 1973-1980 Ferrari 308 GT4?" Ask the Chicago Car Club! Are you wondering "where to sell my 1973-1980 Ferrari 308 GT4 ?" The Chicago Car Club is interested in classic cars of all makes and models, especially a 1973-1980 Ferrari 308 GT4. We make the process of selling your 1973-1980 Ferrari 308 GT4 quick and painless. In just a matter of hours we will have your classic valued and, if you do so choose, turned into money in your pocket. All it takes is a phone call or electronic inquiry to get the ball rolling. The Ferrari 308 GT4 was introduced at the Paris Motor Show in 1973. It was badged, for the first 3 years, not as a Ferrari, but as a Dino, in tribute to Enzo Ferrari’s late son. In 1976 it got its Ferrari badges. 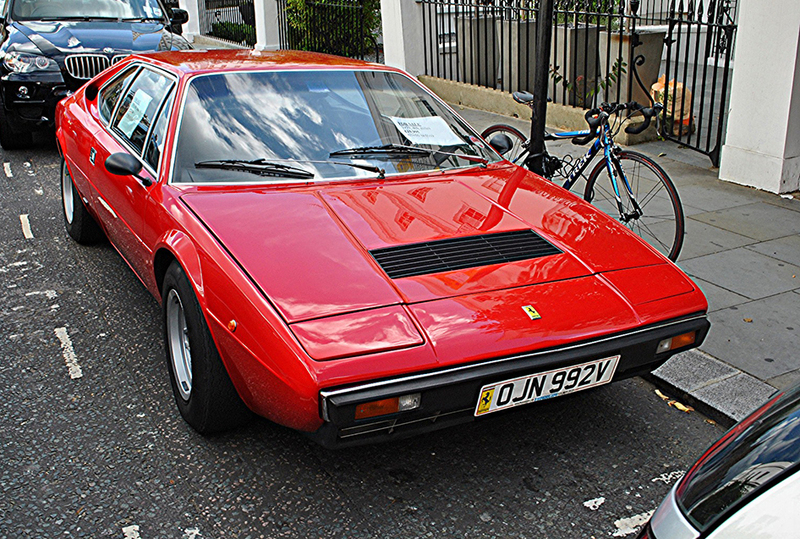 The model was so named the “308 GT4” because it was a 3.0 liter engine with 8 cylinders. It was a grand touring car that seated 4 passengers, in a 2+2 seating configuration. A less powerful engine was sold, mostly to their domestic clients in Italy, with just a 2.0 liter engine, called the 208 GT4. The country had an oppressive 38% tax on cars that exceeded the 2.0 liter engine. The smaller engine had 180 hp engine and the 308 GT4 had a more exciting 255 hp. The Ferrari design house of choice was Pininfarina for more than 20 years. The Dino 308 GT4 received a body design from Bertone’s design house in Turin, Italy. Its angular wedge-shaped design became an instant classic. The power made it loved by auto enthusiasts around the world. It was a rear wheel drive car with a side sitting V8 engine that had a capacity of 2926 cc fueled by four Weber 40 DCNF carburettors. It produced a hefty 255 hp that propelled the 1150 kg car to a maximum speed of over 250 km/hour. Most 308 GT4 cars were only sold outside the US. The only model year that met US emission and safety standards was the 1975 model. Sales were weak, because many buyers thought the price was too steep for a car that was branded as a Dino instead of Ferrari. The next year, in 1976, Ferrari finally gave the 308 GT its “Prancing Horse” Ferrari badges.